As we celebrate our nation’s independence this July, Elks are sure to thank those who served our country in the military. Elks from Old Town, Maine, Lodge No. 1287 show their gratitude to our nation’s heroes this month and throughout the year. 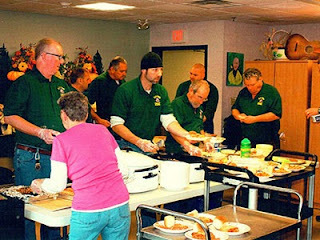 Using an Elks National Foundation Beacon Grant, Elks prepared lunch for veterans living at a veteran’s home in Bangor, Maine. The veterans and their families came for lunch, fellowship and entertainment. As Elks served and ate with their guests, a local barbershop quartet serenaded the crowd. Thanks to the Beacon Grant, Elks were able to serve nearly 100 veterans and their families. Elks and their guests look forward to gathering for lunch again in the coming year.